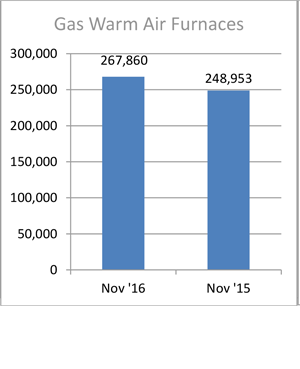 U.S. shipments of residential gas storage water heaters for November 2016 increased 16.8 percent to 349,676 units, up from 299,338 units shipped in November 2015. 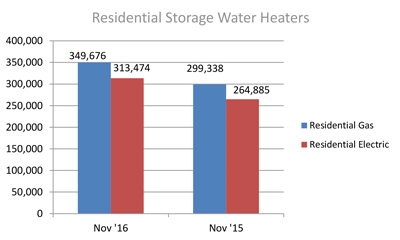 Residential electric storage water heater shipments increased 18.3 percent in November 2016 to 313,474 units, up from 264,885 units. For the year-to-date, U.S. shipments of residential gas storage water heaters decreased 4.3 percent to 3,821,921, compared to 3,992,228 shipped during that same period in 2015. Residential electric storage water heater shipments decreased 2.7 percent year-to-date to 3,592,682 units, compared to 3,691,380 shipped during the same period in 2015. Commercial gas storage water heater shipments increased 7.2 percent in November 2016 to 7,670 units, up from 7,157 units shipped in November 2015. 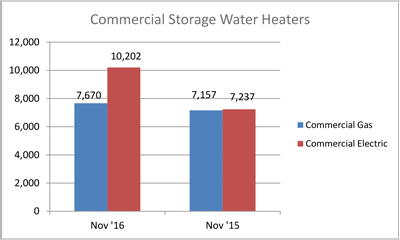 Commercial electric storage water heater shipments increased 41.0 percent in November 2016 to 10,202 units, up from 7,237 units shipped in November 2015. Year-to-date U.S. shipments of commercial gas storage water heaters increased 0.8 percent to 89,507 units, compared with 88,790 units shipped during the same period in 2015. Year-to-date commercial electric storage water heater shipments increased 40.9 percent to 112,229 units, up from 79,675 units shipped during the same period in 2015. 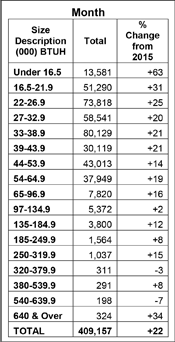 U.S. shipments of gas warm air furnaces for November 2016 increased 7.6 percent to 267,860 units, up from 248,953 units shipped in November 2015. 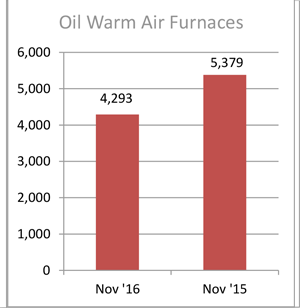 Oil warm air furnace shipments decreased 20.2 percent to 4,293 units in November 2016, down from 5,379 units shipped in November 2015. Year-to-date U.S. shipments of gas warm air furnaces increased 3.1 percent to 2,639,877 units, compared with 2,559,567 units shipped during the same period in 2015. Year-to-date U.S. Shipments of oil warm air furnaces decreased 5.2 percent to 32,233 units, compared with 33,984 units shipped during the same period in 2015. U.S. shipments of central air conditioners and air-source heat pumps totaled 409,157 units in November 2016, up 22.2 percent from 334,907 units shipped in November 2015. 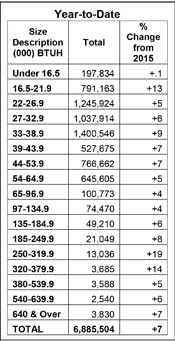 U.S. shipments of air conditioners increased 16.4 percent to 253,895 units, up from 218,076 units shipped in November 2015. U.S. shipments of air-source heat pumps increased 32.9 percent to 155,262 units, up from 116,831 units shipped in November 2015. 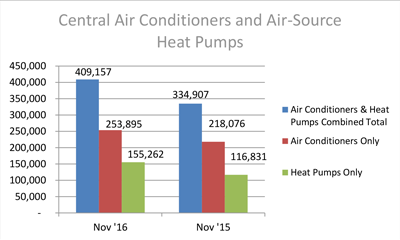 Year-to-date combined shipments of central air conditioners and air-source heat pumps increased 7 percent to 6,885,504 units, up from 6,432,915 units shipped in November 2015. Year-to-date shipments of central air conditioners increased 7.4 percent to 4,619,585 units, up from 4,300,533 units shipped during the same period in 2015. The year-to-date total for heat pump shipments increased 6.3 percent to 2,265,919 units, up from 2,132,382 units shipped during the same period in 2015.